A4 Size 7.3 x 10.25 in. A4 (Mounted) 7.3 x 10.25 in. A3 Size 10.7 x 15 in. (272 x 382 mm) 11.7 x 16.5 in. SMALL 10 x 14 in. (255 x 356 mm) 12 x 16.2 in. 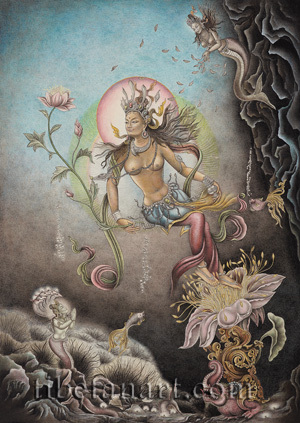 This composition depicts the goddess Ganga as the divine personification of the River Ganges, the most sacred of India's great life-giving rivers. Originally this heavenly river was said to flow from the toes of Lord Vishnu, before her waters were brought down to earth through the penances of a sage named Bhagiratha, who sought to purify the ashes of his sixty thousand ancestors and thereby liberate their souls. The fall of Ganga's torrential waters was cushioned by the matted hair locks of Lord Shiva, who is always traditionally represented with the white stream of the River Ganges cascading from the crowning coil of his matted hair. Ganga's mount or vehicle is a makara or crocodile, and she often appears flanking the doorways of temples along with her sister river goddess, Yamuna, whose vehicle is a turtle or tortoise. Here Ganga glides gracefully beneath her own waters, with her feet resting upon the stamens of a pink lotus. This lotus arises behind the swirling golden tail of her makara vehicle, whose ferocious and snout-headed form crouches on the riverbed. Ganga is adorned with divine silk garments and jeweled silver ornaments, and the long strands of her hair billow upwards in the water. With her left hand she holds her Newar attribute of an ornate silver sinhamu or vermilion-powder container, while with her right hand she holds the long stem of a flowering pink lotus. The riverbed is strewn with luminous pearls and scallop shells, while hair-like strands of river weed billow above the lower rocks. A naga-serpent appears amidst these rocks, with a long serpentine tail, his hands folded in anjali-mudra, and his head crowned with a crest of five small serpents. A beautiful nagini floats in front of the rock formations behind Ganga, with billowing hair and full breasts. From her cupped palms this serpent-queen releases a bunch of leaf-offerings, which drift downwards towards Ganga. Streams of silver bubbles ascend above the naga and the two long-tailed fishes that flank Ganga.